Santa Barbara Winery was established in 1962 by French Canadian Pierre Lafond. It was the first winery opened in santa Barbara since the Prohibition. It was a bold move when wine was still not very trendy in the US and more specifically in California. The winery developed nicely over the decades: acres were acquired, mono varietal and blended wines were added on the list and the winery thrived. It is true that the Estate vineyards are located in the beautiful Santa Ynez Valley. It is now a well known and respected name in the Santa Barbara area – thanks to the effort and work of wine maker Bruce McGuire. Pierre Lafond is also an entrepreneur and opened a few years ago a bakery in Downtown Santa Barbara. It is now a wine bistro with many events. Why are the winery and the wine bistro relevant to this blog? Their marketing director, Annamarie Kostura, took the company on Facebook and Twitter. 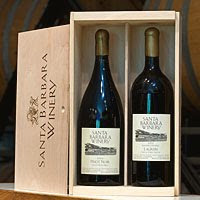 It is not such an unusual move in the wine business nowadays but it is unusual considering the image the winery and the wine bistro are carrying: the Santa Barbara lifestyle, so relaxed and laid back with elegance and refinement. With their presence on Facebook and Twitter, the company acknowledges the new technologies and its understanding of the quicker pace of life in the 21st century. Bottom line? If you want to enjoy the Santa Barbara lifestyle, sit at the Wine Bistro and taste their delicious pastries. If you want to stay connected with real life, follow them on Facebook and Twitter. Cheers!